"Pimpala" redirects here. For the Adelaide suburb of the same name, see Reynella, South Australia. Not to be confused with Chevrolet Opala. The Chevrolet Impala (/ɪmˈpælə, -ˈpɑːlə/) is a full-size car built by Chevrolet for model years 1958 to 1985, 1994 to 1996, and since 2000 onwards as a mid-size car. The Impala is Chevrolet's popular flagship passenger car and is generally among the better selling American made automobiles in the United States. 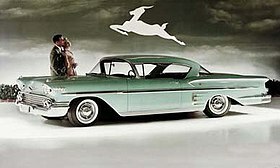 For its debut in 1958, the Impala was distinguished from other models by its symmetrical triple taillights. The Chevrolet Caprice was introduced as a top-line Impala Sport Sedan for model year 1965, later becoming a separate series positioned above the Impala in 1966, which, in turn, remained above the Chevrolet Bel Air and the Chevrolet Biscayne. The Impala continued as Chevrolet's most popular full-size model through the mid-1980s. Between 1994–96, the Impala was revised as a 5.7-liter V8–powered version of the Chevrolet Caprice Classic sedan. In 2000, the Impala was reintroduced again as a mainstream front-wheel drive mid-size car. As of February 2014, the 2014 Impala ranked #1 among Affordable Large Cars in U.S. News & World Report's rankings. When the tenth generation of the Impala was introduced for the 2014 model year, the ninth generation was rebadged as the Impala Limited and sold only to fleet customers through 2016. During that time both versions were sold in the United States and Canada. The current-generation Impala is also sold in the Middle East, China, and South Korea. For 1958, GM was promoting their fiftieth year of production, and introduced anniversary models for each brand; Cadillac, Buick, Oldsmobile, Pontiac, and Chevrolet. 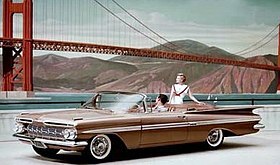 The 1958 models shared a common appearance on the top models for each brand; Cadillac Eldorado Seville, Buick Roadmaster Riviera, Oldsmobile Holiday 88, Pontiac Bonneville Catalina, and the Chevrolet Bel-Air Impala. The 1958 Chevrolet models were longer, lower, and wider than its predecessors. The 1958 model year was the first with dual headlamps. The tailfins of the 1957 were replaced by deeply sculptured rear fenders. Impalas had three taillights each side, while lesser models had two and wagons just one. The Impalas included crossed-flag insignias above the side moldings, as well as bright rocker moldings and dummy rear-fender scoops. The standard perimeter-type frame was abandoned, replaced by a unit with rails laid out in the form of an elongated "X." Chevrolet claimed that the new frame offered increased torsional rigidity and allowed for a lower placement of the passenger compartment. This was a transitional step between traditional construction and the later fully unitized body/chassis, the body structure was strengthened in the rocker panels and firewall. However, this frame was not as effective in protecting the interior structure in a side impact crash, as a traditional perimeter frame. A coil spring suspension replaced the previous year's rear leaf springs, and an air ride system was optional. A 283 cu in (4,640 cc) engine was the standard V8, with ratings that ranged from 185 to 290 horsepower. A "W" block (not to be confused with the big-block) 348 cu in (5,700 cc) Turbo-Thrust V8 was optional, producing 250 hp (190 kW), 280 hp (210 kW), or 315 hp (235 kW). The Ramjet fuel injection was available as an option for the Turbo-Fire 283 V8, not popular in 1958. The Impala became a separate series, adding a four-door hardtop and four-door sedan, to the two-door Sport Coupe and convertible. Sport Coupes featured a shortened roof line and wrap-over back window. The standard engine was an I6, while the base V8 was the carryover 283 cu in (4.6 L), at 185 hp (138 kW). Optional were a 283 cu in with 290 hp (220 kW) and 348 cu in (5.7 L) V8 up to 335 hp (250 kW). Standard were front and rear armrests, an electric clock, dual sliding sun visors, and crank-operated front vent windows. A contoured hooded instrument panel held deep-set gauges. A six-way power seat was a new option, as was "Speedminder", for the driver to set a needle at a specific speed and a buzzer would sound if the pre-set was exceeded. The Impala was restyled on the GM B platform for the first time for 1961. The new body styling was more trim and boxy than the 1958–1960 models. Sport Coupe models featured a "bubbleback" roof line style for 1961, and a unique model, the 2-door pillared sedan, was available for 1961 only. It was rarely ordered. A "Super Sport" (SS) option debuted for 1961. This was also the last year the top station wagon model would have the Nomad name. Power brakes were $43. The 1962 model featured new "C" pillar styling for all models except the 4-door hardtop. Sport Coupe models now featured the "convertible roof" styling, shared with other GM "B" full-size hardtop coupes. This style proved popular. The "overhang" roof style of the sedans was replaced with a wider "C" pillar with wraparound rear window. Engine choices for 1962 included the 348-cubic-inch (5.7 L) V8 discontinued and replaced by the 380 bhp (283 kW) 409-cubic-inch (6.7 L) or 409 bhp (305 kW) 409-cubic-inch (6.7 L) engine. These engines could only be ordered with a manual shift transmission. The small-block 283 was offered with a two barrel carburetor. The 283 was also enlarged to 327-cubic-inch (5.4 L), offered in two versions, one with 250 bhp (186 kW) and one with 300 bhp (224 kW), which added more engine choices for small-block fans. The Beach Boys produced a hit single, "409", referring to the Chevrolet, which became an iconic song for these cars. Impalas again featured premium interior appointments, plusher seats could be done by the dealerships on customer request. And more chrome trim outside, including a full-width aluminum-and-chrome panel to house the triple-unit taillight assembly. Super Sport (SS) models featured that panel in a special engine-turned aluminum, which was also used to fill the side moldings, making the SS more distinctive in appearance. The Impala also gained the top trim station wagon body design, in place of the Chevrolet Nomad model. Due to reliability problems, the optional Turboglide automatic transmission was discontinued, leaving Powerglide the only automatic transmission available until 1965. A new radio was optional. The 1963 Impala featured rectilinear styling with an engine-turned aluminum rear taillight panel surrounded by a chrome border on SS models. Engine choice was similar to 1962, with the small-block 283-and-327-cubic-inch (4.6 and 5.4 L) V8s most popular. The Sport Sedan featured a new, creased roof line. A new "coved" instrument panel with simple indicator lights for hot and cold engine conditions. An optional factory tachometer was built into the dashboard, just above the steering wheel; it was rarely ordered. A special 427-cubic-inch (7.0 L) version of the 409 engine was used in the 1963 Chevrolet Impala Sport Coupe, ordered under Chevrolet Regular Production Option (RPO) Z11. This was a special package created for drag racers, as well as NASCAR, and it consisted of a 427 cubic inch engine with aluminum body parts, and a cowl-induction air intake system. The aluminum body parts were fabricated in Flint, Michigan at the facility now known as GM Flint Metal Center. Unlike the later, second-generation 427, it was based on the W-series 409 engine, but with a longer 3.65 in (93 mm) stroke. A high-rise, two-piece aluminum intake manifold and dual Carter AFB carburetors fed a 13.5:1 compression ratio to produce an under-rated[clarification needed] 430 hp (320 kW) and 575 lb·ft (780 N·m) of torque. 50 RPO Z11 cars were produced at the Flint GM plant. For 1964, the Impala was restyled to a more rounded, softer look. The signature taillight assembly had an "upside-down U" shaped aluminum trim strip above the taillights, but the individual lights were surrounded by a body-colored panel. The 409 cu in (6.7 L) V8 engine returned as the big-block option, as well as the Rochester 2X4-barrel carburetors setup for the 425 bhp (431 PS; 317 kW) at 6,000 rpm and 425 lb⋅ft (576 N⋅m) at 4,200 rpm of torque engines. SS models continued to feature the engine-turned aluminum trim. Rooflines were carried over from 1963 unchanged. Back-up lights were standard. Right hand drive cars were made at GM's Oshawa plant in Canada and often shipped overseas in kit form for assembly in South Africa and New Zealand. The RHD cars — Chevrolet or equivalent Pontiac (built on Chevrolet frames and using Chevrolet engines in Canada) — all used a right hand drive version of the left hand drive 1961 Pontiac dashboard. In 1965, Chevrolet introduced the Impala Caprice, exclusively as a four-door hardtop. Caprices received tufted upholstery, wood grained accents on the dashboard and specialty pulls on the insides of the doors. This "halo" model also featured the "spinner" wheel covers from the Impala SS, with the "SS" logo centers replaced by a Chevrolet "bowtie" emblem. The Super Sport's blackout rear trim strip below the triple taillights was also used, with the "Impala SS" emblem replaced by a large "Caprice by Chevrolet" badge. The Caprice Custom was reintroduced as the Chevrolet Caprice in 1966, taking the top position in the full-size Chevrolet lineup. Engine choices included the inline six-cylinder as well as the small-block and big-block V8s. A new three-range Turbo Hydra-Matic automatic transmission was optional for 396 cu in (6.5 L) V8. The old 409 cu in (6.7 L) "W" engine was discontinued early in the 1965 model year, so early-production 1965s got the 409, as well as 1/10 of 1% had the 396 CID big-block. Other later-built cars had the 396 cu in (6.5 L) as the big-block option. Two-speed Powerglide, as well as 3- and 4-speed manual transmissions were available. As with previous years, Impalas featured more chrome trim inside and out, with pleated tufted upholstery and door panels. The Impala would be the #2-selling convertible in the US in 1966, with 38,000 sold; it was beaten by the Mustang by almost 2:1. 1966 saw a pair of enlarged big-block V8s featuring 427 cu in (7.0 L). The RPO L36 was rated at 385 hp (287 kW), the L72 at 425 hp (317 kW). The L72 was only available with a manual transmission. The 1967 model was redesigned with enhanced Coke bottle styling that featured Corvette-inspired front and rear fender bulges. The curves were the most pronounced with the 1967–1968 models. In keeping with federal regulations, safety features were built into Impalas during the 1967 and 1968 model years, including a fully collapsible energy-absorbing steering column, side marker lights, and shoulder belts for closed models. The L72 engine was not available in 1967, but a L36 Turbo-Jet V8 was optional. The 1968 model was facelifted with a new front end. The new rear bumper housed triple "horseshoe" shaped taillights. 1968 also saw a new Impala model, the Custom Coupe. This two-door hardtop featured the same formal roofline as the Caprice Coupe. It was successful and would be continued right through 1976. The L72 "427 Turbo-Jet" engine was once again returned to the option list, a solid-lifter V8 rated at 425 hp (317 kW). It would continue to be available for both 1968 and 1969, replaced by the Turbo-Jet 454 for 1970. The 1969 Impala and other full-sized Chevrolets got new slab-sided bodies with a small "upsweep" at the rear quarter window, giving them a more formal appearance. It retained the 119-inch wheelbase from previous models. New front bumpers that wrapped around the grille and horizontal taillights were in the rear bumper. The hardtop Sport Coupe got a new notchback roofline, replacing the "fastback" C-pillar from 1967 to 1968. Ventless front windows were used on all models. Chevrolet had a rudimentary "power vent" system featuring vents in the instrument panel. The ignition switch was moved from the instrument panel to the steering column, and when the key was removed, the steering wheel and shift lever were locked. The 1969 model year Impala production topped Caprice production by 611,000 units. Impala station wagons were renamed Kingswood, a name which would continue through 1972. The similar 1970 Impala got a minor facelift featuring a more conventional under the grille bumper replacing the wrap-around unit used in 1969 along with new triple vertical taillights in the rear bumper. Canadian buyers got the choice of a lower priced companion to the Impala Sport Coupe, the Bel Air Sport Coupe, which used the same body but featured Bel Air trim. Right hand drive cars were manufactured in Canada for export to countries such as Australia, New Zealand, the United Kingdom, etc., until 1969. They used a version of the 1965 Impala dash panel — without provision for a radio and installed in a dashboard moulding made of fibreglass, not metal — until 1969. Radios (centrally mounted) and heaters were locally sourced and wipers parked in the center of the windscreen. Australian models were assembled in Australia from kits, as this lessened tax on the cars. The Australian cars had locally sourced amber flashing rear indicators replacing the clear reversing lenses, as red flashers were banned there. For New Zealand assembly, the bodies were supplied from Canada already welded, painted and trimmed. In 1961, the Impala SS (Super Sport) was introduced to the market. The SS badge was to become Chevrolet's signature of performance on many models, though it often has been an appearance package only. The Impala's factory SS package in 1961 was truly a performance package when so equipped from the factory with both the trim and "mandatory" suspension and engine upgrades, beginning with the 348 cu in (5.7 L) V8 engines available with 305 hp (227 kW; 309 PS), 340 hp (254 kW; 345 PS), and 350 hp (261 kW; 355 PS) or the new 409 cu in (6.7 L) V8, which was available with up to 425 hp (317 kW; 431 PS). Unlike all other years, the 1961 Super Sport package was available on any Impala, including sedans and station wagons (the sales brochure shows a 4-door hardtop Sport Sedan with the SS package). The package also included upgraded tires on station wagon wheels, springs, shocks and special sintered metallic brake linings. Only 142 1961 Impala Super Sports came from the factory with the 409. In addition to the factory-installed SS package, Chevrolet dealers could add SS trim to any standard Impala without the "mandatory" performance upgrades, and a number of '61s were so equipped. Starting for the 1962 model year, the Impala SS was an appearance package limited to hardtop coupe and convertible coupe models, available with all engines in the Impala series starting with the base 235 cu in (3.9 L), 135 hp (101 kW; 137 PS) inline-6 through 1967, though the big-block engines and heavy-duty parts could still be ordered. From 1967 to 1969, an additional model, the SS427, was available. The Super Sport was known as Regular Production Option (RPO) Z03, from 1962 to 1963, and again in 1968. From 1964 through 1967, the Super Sport was a separate model, with its own VIN prefix (for V8 models, 168 versus the 164 for the regular Impala). Super Sports from 1962 to 1964 came with engine-turned aluminum trim, which was replaced by a "blackout" trim strip in 1965 which ran under the taillights. 1965 Super Sport exteriors differed only slightly from regular Impalas. Rocker panel trim was deleted. "Super Sport" scripts replaced the "Impala" fender badges. The new center console housed a rally-type electric clock, and full instrumentation now included a vacuum gauge. A total of 243,114 Impala SS coupes and convertibles were built for 1965. The 1966 Impala SS was facelifted with a revised grille and new rectangular taillights that replaced the triple round units. A chrome beltline strip shared with regular Impalas was added in response to complaints about door dings on the clean-lined 1965s. Inside were new "Strato-bucket" front seats with thinner and higher seat backs, and a center console with an optional gauge package available. Sales of the 1966 Impala SS dropped by more than 50% to around 117,000 units; this was mainly due to the sport/performance car market switching from full-sized models to intermediates (including Chevrolet's own Chevelle SS396 and Pontiac GTO), along with the emerging market for the even smaller pony car market created by the Ford Mustang in 1964 that Chevrolet would respond to with the Camaro for 1967. The 1967 Impala SS was less decorated than other Impalas; Super Sports had black grille accents and black-accented body-side and rear fender moldings. Lesser models leaned more toward brightwork inside and out. Buyers could choose either vinyl bucket seats with a center console, or a Strato-Bench seat with a fold-down center armrest. Standard wheel covers were the same as the optional full covers on other big Chevrolets, but the centers featured the "SS" logo surrounded by tri-color ring of red, white and blue. "Chevrolet" and "Impala" callouts on the body were all replaced by "Impala SS" badges. Of the 76,055 Impala SS models built, just 2,124 were ordered with RPO Z24, a special performance package that included RPO F41 heavy-duty suspension and other performance features, RPO L36 (385 hp (287 kW; 390 PS)) Turbo-Jet 427 cu in (7.0 L) V8, as well as a special trim package that replaced the "Impala SS" badges with large "SS427" emblems on the front grille and rear trim. None of these cars had the name "Impala" anywhere on the body or interior, and Chevrolet often marketed them as the "Chevrolet SS427," sans the "Impala" name. The Z24 package also included a special hood with fake chrome-plated intake. Only about 400 Super Sports had a six-cylinder engine from 1967 to 1968, 390 hp (291 kW; 395 PS) in 1969, or L72 (425 hp (317 kW; 431 PS)) from 1968 to 1969. Special SS427 badging, inside and out, was the rule, but few were sold, since muscle car enthusiasts were seeking big-block intermediates, such as the Chevelle SS396 and Plymouth Road Runner. In 1968 as Caprice sales escalated, those of the Impala Super Sport suffered a decline. Much of this drop in sales was no doubt due to the availability of big-block engines in the mid-sized (and lighter) Chevelle, and even Novas could be special-ordered with the 396 engine with the new-for-1968 body. No longer a separate series, the Super Sport was a mere $179 option package (Regular Production Option Z03) for the two Impala coupes and the convertible. Only 38,210 Impalas were so-equipped, including 1,778 with the Z24 package, which was carried over from 1967. In 1968 only, SS427s could be ordered without the Z03 SS package, which meant SS427 equipment but no bucket seats, SS door panels, or center console. The Z03 Impala SS could be identified by "Impala Super Sport" badges on the front grille, rear fenders and trunk lid. Z24-optioned cars included "SS427" emblems to replace the "Impala Super Sport" badges, a special layered "pancake" hood, and three "gills" mounted on the front fender aft of the wheel well à la Corvette Stingray. The 1965–1970 GM B platform is the fourth best selling automobile platform in history after the Volkswagen Beetle, Ford Model T and the Lada Riva. The Impala remained Chevrolet's top-selling model with the fifth generation. A high-performance big block V8 was still available in the form of the Turbo-Jet 454, which produced 365 hp (272 kW) in 1971, but power decreased as the years went along. The 1971 redesigned B-body would be the largest car ever offered by Chevrolet. The hardtop Sport Coupe continued to be offered; it was a smoothly sloped semi-fastback reminiscent of the 1961 "bubbletop" styling. A three-speed manual transmission remained standard at the beginning of the year, but in the spring of 1971 all V8-equipped full-size GM cars got Turbo Hydra-Matic as standard equipment. Powerglide remained optionally available for six-cylinder cars until the 1973 models. In keeping with their huge size, these new "B" body Chevrolets were close to Cadillac in luxury features, styling, and ride. Like all GM "B" bodied cars, Impala got a new power ventilation system that remained on while the ignition was on, and included both large vents in the instrument panel and louvers in the trunk. However, the system proved to be problematic and was disliked by many buyers. The 1972 model has a grille which extended below the bumper. Powertrains consisted of mostly V8 engines. The 250 inline six was still standard for Sport Coupe and 4-door sedan models; the 350 2bbl V8 became the standard engine from 1973–1976, with 350 cubic inches (5.7 L), 400 cubic inches (6.6 L), 402 cubic inches (6.6 L) (through 72) or 454 cubic inches (7.4 L) optional. The best-selling body style was the formal-roof Custom Coupe. Beginning in 1972, all engines were designed to run on unleaded gasoline. 1972 saw the last Impala convertible; it sold 6,456 copies, placing fourth with just under 9 percent of the market, right behind the Corvette 6,508, ahead of the Mustang's 6,401. The power ventilation system was improved, and exit vents were moved from the trunk lid to the door pillars. 1973 Chevrolets featured a larger, shock-absorbing front bumper due to new federal mandates which required 5-mile-per-hour (8.0 km/h) impact protection. New taillights were mounted in the (still) conventional rear bumper. The convertible was moved upmarket to the Caprice Classic series. Tweaks to the suspension and frame gave better roadability, according to Chevrolet general manager John Z. DeLorean. Steering wheels and instrument panels were color-keyed to interior colors, as opposed to the matte black used in 1971–1972. The steering wheel rim got a soft-feel grip, and replaced the "Impala" badge with generic "Chevrolet." The inline six-cylinder engine was now offered on the Bel Air 4-door sedan only, and only with the 3-speed manual transmission. Interiors had repositioned front seats for more legroom. The Impala name returned for the Kingswood station wagon. Suspension and chassis design was modified for better roadability. 1,000 1973 Impalas were built with an "Air Cushion Restraint System" (ACRS) that used an Oldmobile instrument panel and unique steering wheel that contained both a driver and front passenger air bag. They were all four-door sedans painted in a special green-gold color. The system was not advertised in a big way and many of the cars were used for crash testing by both GM and the Federal government. Over the decades the system proved durable and successfully protected front passengers in front-end collisions. Unfortunately Chevy did not offer ACRS in 1974; however it was offered in Oldsmobile and Cadillac models that year as an option and did save lives. One ACRS-equipped Impala was preserved and remains a witness to the ability of an American automaker to design life saving safety systems into cars without a government mandate. No other examples are known as of this time. In 1974, the rear bumper was redesigned with shock absorbers to meet the upgraded standards and new tail lights were featured. The front end was also freshened as in previous years, with a new grille and headlight bezels, a new header panel, and a bumper with a drop down center section. The marker lights moved back up beside the headlamps once again. This was the only year of the 1971–1976 models the Impala had a different front end design than the Caprice Classic, as other years used either a grille insert or previous year Caprice front to distinguish the two. The rooflines of the Impala coupes were also revised. For 1974 the Custom Coupe was no longer a hardtop, with large fixed rear quarter glass and a thick B-pillar. The Sport Coupe, still a pillar-less hardtop, now used larger roll-down quarter glass like that of the 1971–1973 Custom Coupe, and had a narrower, fastback style, flat back window. Sedans used carryover body shells from previous years. A limited-edition Spirit of America package was offered in 1974 on Sport Coupe models; primarily an appearance package, it featured white or blue body paint, a white full vinyl top, white upholstery with red or blue trim, color-keyed seat belts and floormats, special wheel covers, optional white rally wheels, sports-styled dual remote outside rear view mirrors, a vinyl body side molding insert, and red pin-striping. Special fender and dashboard badges announced the package to passers-by and passengers. Chevrolet also offered Nova and Vega Spirit of America versions as well. The 1975 Impala used a 1974 carried-over Caprice front end, with a grille insert and emblem change. The Caprice model was revised with a new front end with a swept back style header panel with recessed headlight buckets, a new hood, and new fenders. Also in 1975 upholstery, door panels and the dashboard were revised as were the radio and climate control graphics. Speedometers read up to 100 mph (160 km/h), and added kilometers per hour. A High Energy Ignition (HEI) system was officially introduced in 1975, although it was installed on some 1974 cars as a clandestine option. Catalytic converters were also introduced, as were several new options, including an Econominder gauge package (which also included a coolant temperature gauge), intermittent wipers, and a divided 50/50 bench seat with passenger-side recliner (with a choice of sport cloth or vinyl trim). This was the final year of the full-size Chevrolet convertible. Four-door models got new rooflines; the hardtop Sport Sedan got a small triangular "opera window" carved out of the wide roof panel. A Landau model available for 1975–1976 models featured a landau vinyl roof (with a chrome band across the roof), a choice of special paint colors, sports-styled dual remote outside rearview mirrors, color-keyed wheel covers, a vinyl bodyside molding insert, and pin-striping. Inside were color-keyed seat belts and floormats. Fender and dashboard emblems rounded out the package. The 2-door hardtop model (dubbed the "Sport Coupe") was discontinued after 1975, leaving redesigned Custom Coupe, with its wide "B" pillar and fixed rear window, the only 2-door Impala available in 1976. This body style had been introduced for the 1974 model year, a precursor to Detroit's complete abandonment of pillarless body styles before the end of the Seventies. 1976 Impalas used a previous year Caprice nose, with a new "egg crate" grille insert. The Impala had round headlamps while the Caprice used the new quad rectangular ones. Pillarless hardtops were discontinued, the result of rumors of federal rollover standards looming in the near future. The 1977–1979 coupes sported a double bent tempered rear window similar to the 1987 Chevrolet Monte Carlo Aerocoupe. In 1980, all new sheet-metal was used, although the body style remained similar. Engine availability was reduced for 1977; the inline-6 was reintroduced with 110 hp (82 kW). Options included 267-and-305-cubic-inch (4.4 and 5.0 L) V8 engines. The 350-cubic-inch (5.7 L) V8 engine was optional in some years. Oldsmobile's 350-cubic-inch (5.7 L) V8 diesel engine also was available. Starting in 1980, the inline 6 was replaced by a generic 229 cubic-inch V6 from Chevrolet which was totally different from the 3.8 liter (231 cubic inch) V6 from Buick that was installed in numerous GM models of different divisions. The Impala and the upscale Caprice sold well into the early 1980s. The Impala was reduced to the base model full-size Chevrolet and was popular with fleet usage – including taxi and police-pursuit vehicles, but was discontinued in 1985, while the Caprice continued unchanged until 1990. Upon the demise of the Impala, the base model full-size Chevrolet was rebranded Caprice starting in 1986, with the upper models being called the Caprice Classic and Caprice Classic Brougham. Black background with Caprice logo Woodgrain background with Caprice logo Silver background with word "CHEVROLET"
The entire B-body line, consisting of the Chevrolet Caprice, Impala SS, and Buick Roadmaster, was discontinued, as GM wanted more assembly lines to be able to produce the more profitable SUVs. A ceremony was held at the plant on December 13, 1996, as the last Impala SS was produced. The Impala name was revived for the 2000 model year as the "Hi-Mid" program to rename the Lumina as the Chevy Impala. [clarification needed] Based on the Lumina's W-body platform, it was built at Oshawa Car Assembly in Oshawa, Ontario, Canada. Unlike the earlier Impalas built on a B-body, this one was front-wheel drive and was available with a choice of two engines, the ever-enduring 3.8L V6 engine, and the slightly smaller 3.4L V6 engine. A new Impala SS with a supercharged V6 was brought out for the 2004 model year. The Impala was available in two trim levels from 2000 to 2003. The base model came equipped with cloth bench seats, steel wheels, the 180 horsepower (130 kW) 3.4 liter (204 cu in) LA1 V6, and a 3-gauge instrument cluster. 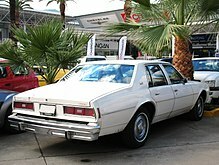 The LS came factory-equipped with cloth bucket seats upgradeable to leather with center console and floor shift, color-keyed "Impala" door scripts and trunk badge, anti-lock brakes, traction control system, keyless remote entry, integrated foglamps, aluminum wheels upgradeable to alloy wheels, rear spoiler (optional on the base models), 4-gauge instrument cluster (with tachometer), and the larger 200 horsepower (150 kW) 3.8 liter (231 cu in) L36 V6. Options available on all models included a sunroof, OnStar system, Driver Information Center with built-in HomeLink system, heated power front seats, and 16 inch 1990s SS-inspired wheels. All models came equipped with power windows, door locks and mirrors. The rear spoiler was an option on base models, and could be deleted from LS models upon buyers request. The 2004 to 2005 Impala SS came equipped with the 3.8 liter (231 cu in) supercharged L67 V6 engine. It was rated at 240 horsepower (180 kW) and had been previously used in the Pontiac Grand Prix GTP, Buick Regal GS, Buick Riviera, and H-body Pontiac Bonneville SSEI and Buick Park Avenue "Ultra". The lighter front-wheel-drive sedan was as quick as the vaunted 1990s Impala SS, with 0–60-mile-per-hour (0–97 km/h) times pushing 6.5 seconds, compared to the earlier model's time also showing 6.5 seconds (albeit 7.1 seconds on average). To commemorate Chevrolet's long relationship with the Indianapolis Motor Speedway and the Indianapolis 500 race, a limited edition (4,088 produced) Impala Indy SS was offered in 2004, featuring black grille with gold Chevrolet bowtie emblem that would be carried over to all Impala models in 2005, various Indy logos on the exterior and interior, 17-inch chrome wheels, gauge cluster package, and more. Also released with this version were the Police Package first released in 2000 and Undercover Police Package first released in 2001, named 9C1 and 9C3, respectively. Available only to law enforcement agencies, fire departments, and EMS agencies, it has had much more success than its predecessor, the Lumina 9C3. The 9C1 was a base model with a stronger suspension and the 3.8 liter (231 cu in) V6 engine. It also came with the option for a rear vinyl bench seat and front cloth bucket or bench seats, both cloth front and rear seats, or vinyl front and rear seats. It also offered preparation for a criminal cage to be installed between the front and rear seats. It was only available in a few basic colors. Another addition was the "SURV MODE" switch that replaced the fog light switch found on the LS. This enabled the driver to turn off all lights in the vehicle and "hide"; something not allowed with the civilian models, as automatic headlights were standard. The 9C3 was comparably equipped to the 9C1, but the ability to add other convenience options and more paint and interior choices set the 9C3 apart. The Impalas 9C1 and 9C3 sales were strong with law enforcement and were especially popular with large city fleets such as the NYPD and Philadelphia Police Department. However, the Ford Crown Victoria P71 still held the sales lead and was preferred by most agencies due to its larger size and much more durable V8 engine and rear wheel drive layout. The 2006 Impala was introduced at the 2005 Los Angeles Auto Show in January. Like the Buick LaCrosse, the ninth generation Impala used the updated GM W platform. The base engine was a 3.5 L (214 cu in) V6 producing 211 hp (157 kW) and 214 lb⋅ft (290 N⋅m) of torque at 4,000 rpm. The new Impala featured new taillights, different from the four-circle style of the previous generation. This Impala mostly sold to fleet operators, with private buyers accounting for a quarter of sales. The SS model used the Generation IV small-block V8, the first to do so in a front-wheel-drive Chevrolet, and the first V8 in a Chevrolet sedan since the 1996 Caprice. The 5.3 L (325 cu in) V8 (with Displacement on Demand, called Active Fuel Management or AFM) produced 303 hp (226 kW). With the use of the 5.3 L LS4 V8, the Impala SS is capable of a 5.6 second 0–60 mph (0–97 km/h) time and a quarter-mile time of 14.2 seconds traveling at 101 mph (163 km/h). The ninth generation Impala was 200.4 in (5,090 mm) long, 58.7 in (1,491 mm) high, and 72.9 in (1,852 mm) wide with a drag coefficient of 0.33. Available trim levels for the ninth generation were the LS, LT, LTZ, and the SS, respectively. Six-passenger seating was only available as an option on the LS and LT models. Leather upholstery was standard on LTZ models and optional on LT models. The ninth generation Impala featured a wood trim center console with chrome accents on all major control buttons. The dashboard featured a chrome Impala logo embedded in the wood grain trim that runs across the dashboard and onto the doors. The control knobs found throughout the vehicle's cockpit were similar to those found in Buick models as well as the Cadillac DTS, all of which featured a similar center console. Another interior revision was the location of the cup holders, which were moved beneath the midsection of the vehicle's center console. The LS was the base model. It offered steel wheels with wheel covers (later alloy wheels), an AM/FM stereo with single-disc CD player, auxiliary input jack, and six speakers, keyless entry, air conditioning, cloth seating surfaces, and a choice of two front bucket or a single front bench seat. The LT was the mid-range model. It offered alloy wheels, MP3 playback capabilities, and optional front heated seats. The LTZ was the most luxurious model. It offered leather seating surfaces that were heated, an AM/FM stereo with six-disc CD/MP3 changer in the dash and a Bose eight-speaker premium sound system, a power sunroof, security system, and OnStar. The SS was the top-of-the-line model until 2009. It offered a 5.3 L V8 engine, leather-and-suede seating surfaces, eighteen-inch machined-finished alloy wheels, and SS badging (The 2006–09 model was the first Impala with a V8 engine since 1996). Due to its unpopularity, the SS trim was discontinued in 2009, leaving the LTZ as the top-of-the-line model for 2010 to be the most powerful, and for a shorter time in 2012–2013, the LS, LT, and LTZ trims were 300 horsepower, and also on the Impala Limited from 2014–2016. In 2007, the Impala received the FlexFuel 3.5-liter V6 and Flex Fuel rear badge for the LS, LT, LTZ, and Touring. A new 3.9 L V6 with Active Fuel Management was available. The SS retained the same drivetrain and did not receive the FlexFuel feature due to the high-performance nature of the powertrain. A tire-pressure-monitoring system, cruise control and a CD player were standard on all models, and a factory spoiler was an available option. The LT had 16-inch, five-spoke alloy wheels. The generation-7 OnStar system with turn-by-turn navigation was included when the available directions and connections service was selected. The SS had standard leather-appointed seats and XM Satellite Radio, with XM being optional on LS, LT, and LTZ trims. A new Luxury Edition package featuring leather seating, folding rear seat, and rear spoiler was offered on the LT. There were four new exterior colors—Precisions Red, Imperial Blue Metallic, Bordeaux Red, and Red Jewel Tintcoat, as well as a Regency-outfitted "Impala RSS". The RSS included aggressive wheels, front/rear bumper and rocker panel extensions, a spoiler and various interior upgrades. To commemorate the Impala's 50th year, a 50th Anniversary Edition was introduced in Spring 2008. Based on the LT, it added a FE3 Sport Suspension (replacing the FE1 Touring Suspension), four-wheel ABS, eighteen-inch SS-style alloy wheels (replacing the 16-inch wheels), rear SS style spoiler, "50th Anniversary" Impala badges on the C-pillars, two-tone, leather-trimmed seats with "50th" logos embroidered on the front headrests, eight-way power-adjustable driver seat, leather-wrapped steering wheel with accent-color threading including audio controls, ebony carpet, ebony floor mats with accent threading, "50th" Anniversary emblems on the sill plates and a choice of two premium exterior colors: Black Granite Metallic and Red Jewel Tintcoat A Luxury Edition package was again available on the LT and now also featured leather-wrapped steering wheel, steering wheel mounted audio controls, traction control, and anti-lock brakes. For the 2009 model year, the Impala received three new exterior colors: Victory Red, Silver Ice Metallic, and Aqua Blue Metallic, while the brushed aluminum dash applique was no longer available. All models used the previous SS style spoiler (actually phased in for the late 2008 model year). The Touring trim level was discontinued for 2009. Leather seating was no longer available in combination with the 40/20/40 split bench front seat. The Active Fuel Management feature remained on the 5.3 L V8 with a 17-gallon gas tank for the SS model, but was no longer available on 3.9 L V6 for the LT and LTZ models. A sun and wheel package was available on 1LT models included power sunroof, overhead console with Homelink and 17-inch aluminum wheels. A Bose Premium Audio System was now part of the Luxury Edition package offered on LT models. Thorax side-impact air bags were standard. For the 2010 model year, the Impala was the only GM W-body car in production, although the eight-cylinder SS model was discontinued. LT models included fog lights and once again offered an optional Luxury Edition package. The 3.9 L V6 was no longer available for the LT model. Three new exterior colors were available: Summit White, Cyber Gray Metallic, and Aqua Blue Metallic, and four exterior colors were deleted. The (PDG) convenience package, AM/FM stereo with 6-disc in-dash CD changer, and trunk cargo net were no longer available. The Impala emblems on rear sail panels as well as the rear decklid badge on LS models were deleted. Early 2010 models had the lower front-side GM badges but were also later deleted. For the 2011 model year, Impala returned in LS, LT, and LTZ trims. Available engines were a 3.5 L V6 (LS or LT) or a 3.9 L V6 (LTZ only). A Luxury Edition package was again an option on the LT and featured leather heated seats, 6-way power front passenger seat, Bose Premium Audio System, XM radio, auto-dimming rearview mirror, Universal Home Remote, outside heated power mirrors, and rear spoiler. The 2011 Impala had the same wheels as the 2012–2013 Impala, but the 2011 Impala was the last model year where the chrome trim on the trunk lid appeared. For the 2012 model year, the exterior received a slight refresh and 4 trims: a standard Impala, LS, LT, and LTZ. The 3.5 and 3.9 L engines were dropped in favor of a single, 3.6 L LFX that delivers 302 hp (225 kW) and 262 lb⋅ft (355 N⋅m) of torque. The four-speed automatic transmission is also deleted in favor of a six-speed automatic. The Impala also received new packages, including the LS Uplevel package, LS OnStar and Bluetooth package, LT Sunroof package, LT OnStar package and the LT OnStar and Bluetooth package. For the 2013 model year, the Impala was largely a carryover of the 2012 model. Available trims were once again LS, LT, and LTZ. It was the last retail Impala to be offered with optional bench seat and column shift transmission. A Luxury Edition package, last seen on the 2011 model, returned as an option on the LT and featured perforated leather seating surfaces, dual front heated bucket seats with driver's side 8-way and passenger's side 6-way power adjusters, inside rearview auto-dimming mirror, Universal Home Remote, outside heated power adjustable mirrors, Bose 8-speaker premium sound system, six-disc in-dash CD changer that played MP3 and WMA files, with Radio Data System, Sirius-XM satellite radio, and well as iPod and USB inputs, as well as an auxiliary input. This was the last car to have a bench seat in the front. Due to the early release of the redesigned 2014 model, the 2013 Impala had an abbreviated model year. The ninth generation model remained in production in LS, LT, and LTZ trim until the 2016 model year as a rental, fleet, and police car under the revised model name "Impala Limited". The consolidated plant in Oshawa, Canada continued making the Impala Limited, along with the Chevrolet Equinox. Production ended in May 2016. The Impala again was offered as a police vehicle in the ninth generation form. The 9C1 and 9C3 models were based on the LS model, yet offered steel wheels or steel wheels with wheel covers, optional rubber flooring, preparation for police equipment such as sirens, radios, and lighting, special badging, and inoperable rear door handles, windows, and door locks. It also came with the option for a rear vinyl bench seat and front cloth bucket or bench seats, both cloth front and rear seats, or vinyl front and rear seats. It also offered preparation for a criminal cage to be installed between the front and rear seats. The foglamps seen on the LT, LTZ, and SS were optional in 2008 & stayed as an option until 2012 which did away with that option. The 9C1 and 9C3 also had the option of having the spoiler seen on the LT and LTZ until being replaced by the spoiler that is on the SS and other models in 2009. The police sedans received the FlexFuel in 2008 feature to compete against the Ford Crown Victoria Police Interceptor, which also received a similar feature allowing it to utilize E85. The Impala 9C1 and 9C3 models used the 3.9 L (237 cu in) V6. Police Sedans utilized the SS radiator and cooling system as an upgrade from the standard 3.9 L engine (used in the Impala LTZ). GM did not wish to design a specific radiator and cooling system to equip a low-production V8 police vehicle. Also, the heavy-duty steel wheels were not redesigned, and as such, the Police Sedan used the original center caps or the older style wheel covers from the 8th generation model. The 9C1 and 9C3 were equipped with an external trunk lock tumbler starting in 2008. Neither feature was available for the civilian version of the car. The 9C1 and 9C3 police models had the standard wood grain for the 2006 model year until 2007 which was replaced by an aluminized interior trim. For the 2012 model year both the 9C1 and 9C3 have different end caps where the fog lamps are on the LT and LTZ trims on the front end bumper, received 17-inch wheels with new wheel covers, and the same LFX V6 that powers the civilian Impala. The Caprice PPV succeeded the Impala 9C1 after production ended in 2016. Up to then, the Caprice 9C1 and Impala 9C1 was offered simultaneously. A 2014 Chevrolet Impala on display at the New York International Auto Show in April 2012. This tenth generation Impala is larger than the previous generation, sharing the extended Epsilon II FWD platform with the Cadillac XTS. The current generation is assembled in Oshawa, Ontario, Canada, alongside the ninth-generation Impala (now renamed the fleet and rental exclusive-only Impala Limited), and at the Detroit/Hamtramck Assembly in the United States. All trim levels are equipped with a six-speed automatic transmission with sport and manual shifting modes. The tenth generation models were shipped to dealerships across North America on March 25, 2013, and officially went on sale to the public April 1, 2013. That same day regular production on the Impala (the 2.4L eAssist and 3.6L equipped versions/LT2 and LTZ2 trims only) began at their Oshawa plant, while production at GM's Detroit-Hamtramck plant (the 2.5L equipped versions/LS, LT1 and LTZ1 trims) started production on April 8 and arrived to dealerships in May. The eAssist versions went on sale in the fourth quarter of 2013. In 2014, the Impala saw its share of the full-size sedan market increase to 14.7 percent, up from 6.9 percent in 2013. The 2014 Impala came standard with 18 inch wheels (19, and 20 inch offered in higher trims), low profile HID Headlights and LED daytime running lights (On LTZ trim) and offered in three engines; a 2.5 L 4-Cylinder (the first time the Impala will use this type), a 2.4 L 4-Cylinder with hybrid-assist technology, and a 3.6 L V6. The interior came equipped with a 4.2-inch color display featuring Chevrolet MyLink (LT and LTZ trims), HD Radio (all trims) and Pandora Radio (LT and LTZ trims), Active noise cancellation for all 4-cylinder options, while new safety features included 10 Standard Airbags combined with OnStar. Optional features for the 2014 model included "full-speed-range adaptive cruise control, collision mitigation braking, forward collision alert, lane departure warning, side blind zone alert, rear cross traffic alert, rear camera and rear-park assist." For 2015, 4G LTE was added to OnStar as an optional feature HD Radio was no longer offered starting with the 2015 model year. In addition, the eAssist version was discontinued due to low sales. For the 2016 model year, the Impala went from five to four level trims: LS, LT1, LT2, and LTZ2. A Midnight appearance package was added as an upgrade for the LT and LTZ level trims, which included unique black-pocket wheels and gloss black badges in addition to the standard black paint. Five new colors were introduced: Siren Red Tintcoat, Citron Green Metallic, Heather Gray Metallic, Mosaic Black Metallic, and Green Envy Metallic; six colors were dropped: Autumn Bronze, Red Rock, Crystal Red Tintcoat, Ashen Gray, Silver Topaz, and Champagne Silver. The Jet Black/Brownstone interior color scheme was dropped. 2016 models also came equipped with a new 800 cold-cranking amps battery, replacing the 900 CCA. Wireless charging for devices, front and rear splash guards, as well as lane change alert were added. The CD player was now only offered as standard equipment on the LTZ, but available as an option on other trims as part of the Technology package. 2016 also saw the addition of Apple CarPlay and Android Auto Capability features; only one phone brand at any one time can be used. The 2017 model year Impala only saw minor changes, with the top of the line LTZ trim rebrand as the Premier trim and Pepperdust Metallic introduced as a new color option. The LS trim, previously available only with the four-cylinder engine, became available with the V6 engine in addition to the four-cylinder engine. The 2018 model year Impala went from four trims to three: LS, LT, and Premier. The LT level trim added Entertainment, Convenience, and Leather packages options, while the Premier trim received the top of the line Convenience package. Keyless starts, rear camera view, and MyLink became standard on all three levels trims, as the LS trim deletes the 4.2 inch display and AM/FM radio features. Daytime running lights became standard on LT and navigation became standard on Premier. During the Third Quarter of 2018 three new colors, Nightfall Gray Metallic, Cajun Red Tintcoat, and Graphite Metallic, will be introduced. The 2019 model year Impala will see only minor changes. The jet black interior is added to the LT convenience package, while the accessory level wheel locks becomes standard on all trims. The Graphite Metallic color is discontinued. The 2015 Chevrolet Impala Bi-Fuel runs on CNG (compressed natural gas) and gasoline. Unveiled in October 2013 by General Motors CEO Dan Akerson, the Bi-Fuel Impala would be offered to both fleet customers and retail. It is the only full-size CNG vehicle manufactured in North America. The new Impala will join the Honda Civic as a rare factory made CNG car to come straight from a major automaker and available for retail sales. The 2015 Chevrolet Impala Bi-Fuel has a 500-mile driving range. It will allow the driver to switch from gasoline to CNG or from CNG to gasoline at the push of a button. The CNG tank is placed in the trunk. The Impala Bi-Fuel was one of the five finalists for the 2015 Green Car of the Year Award during the 2014 Los Angeles Auto Show, but lost to the BMW i3. The Impala went on sale in South Korea as an export vehicle for the 2016 model year, marking the first time that Chevrolet had offered an American-built full-size sedan in the Korean market. LS Includes: 2.5L EcoTec Inline Four-Cylinder (I4) gasoline engine, six-speed automatic transmission, Eighteen-inch (18") black-painted steel wheels with full plastic wheel covers, 4.2-inch (4.2") color LCD radio with Bluetooth (2014-2017 models), eight-inch (8.0") Chevrolet MyLink infotainment system (2018+ models), 100-watt six-speaker audio system, keyless entry, premium cloth seating surfaces (2014-2017 models), premium cloth seating surfaces with leatherette trim (2018+ models), power-adjustable front driver's bucket seat, OnStar with 4G LTE Wi Fi capabilities (2015+ models), leather-wrapped steering wheel, split-folding rear bench seat, color-keyed exterior door handles, and black side mirrors. LT Adds to LS: Eighteen-inch (18") aluminum-alloy wheels, eight-inch (8.0") Chevrolet MyLink infotainment system, security system, remote vehicle start, premium cloth seating surfaces with leatherette trim, dual power-adjustable front bucket seats, color-keyed side mirrors, and wood interior trim. LTZ (Premier) Adds To LT: 3.6L VVT V6 gasoline engine with FlexFuel capabilities, nineteen-inch (19") aluminum-alloy wheels, keyless access with push-button start, luxury leather-trimmed seating surfaces, dual heated front and rear seats, heated leather-wrapped steering wheel, exterior LED Daytime Running Lamps (DRL's), rearview backup camera system, chrome-accented color-keyed exterior door handles with touch sensors, and chrome side mirrors. There was talk of GM discontinuing the Impala altogether, due to declining sales of full-size sedans as well as sedans in general, in order to make room for more production of crossover SUVs. GM CEO Mary Barra later said that unlike Ford and FCA, GM had no plans to exit the sedan market, and at the time stated that the Impala will continue in production as a way to fill the void left by the planned departure of the Ford Taurus in 2019. However, GM reversed course and now plans to idle the Detroit-Hamtramck and Oshawa assembly facilities; the Impala will cease production after the 2020 model year, with the final vehicles coming off the assembly line in January 2020. GM decided to keep the Impala in production after reversing plans to end it in June 2019 with the extension of the assembly plants to its idling in 2020. In the Insurance Institute for Highway Safety's crash tests, the 2000 to 2005 Impala was given a "Good" rating overall for good structural performance and no chance of any significant injury in a crash of its severity, except for maybe a minor lower-left-leg injury, such as a bruise or sprain. The 2006 to present Impala is given a lesser overall "Acceptable" score for front impact collisions. and a "Good" score for side impacts. Side-curtain airbags are standard for front and rear rows; side torso airbags previously unavailable became standard on all trim levels beginning with the 2009 model year. GM made some minor structural enhancements to the Impala, beginning in December 2009; models produced after that received a "Good" in the IIHS frontal offset crash test. In September 2009, a local news station's investigative team in Rhode Island discovered that GM's fleet customers who purchased the 2006–2009 Impala were able to order them with the side-curtain airbags deleted for a savings of $175 per vehicle. Because these fleets typically sell off their cars after two to three years of use, many of the Impalas that were built without side-curtain airbags became privately owned cars. Current owners may be able to tell if their car has side airbags by checking the VIN and/or by checking to see if "Air bag" is printed on the roof support between the front and back rows. On April 22, 2014, the NHTSA opened an investigation into 60,000 2014 Chevrolet Impala models over concerns relating to the sedan's emergency braking system. This followed the NHTSA receiving a complaint from a driver who experienced "inappropriate activation of the emergency braking system," adding it "alleges that the driver assist system inappropriately activated emergency braking bringing the vehicle to a complete stop under what the driver considered to be full braking force." The driver also went on to say that he heard three to four beeps from the system while driving the rented vehicle, which had only 2500 miles on it. GM is fully co-operating in the investigation. Motor Trend magazine awarded the full-size Chevrolet including the Impala as its 1977 Car of the Year. Automotive Fleet and Business Fleet magazines awarded the Impala the 2006, 2007, and 2008 Fleet Car of the Year. Canadian Automobile Association (CAA) selected the Impala for its 2006 Pyramid Award for Environmental Initiatives for the launch of its new ethanol-powered E-85 model. NASCAR Chevrolet Impala from Universal Orlando Resort painted to resemble the #88 car driven by Dale Earnhardt, Jr. in the Sprint Cup Series. In 2007, the Impala began to replace the Monte Carlo on the NASCAR stock car racing circuit; more specifically, on all the scheduled racing events where NASCAR has mandated the use of a car with different (and some new) specifications, better known as the Car of Tomorrow. The Impala was also used to represent Chevrolet in the Nationwide Series. In 2013, the Impala was replaced by the Camaro in the Nationwide Series. The 2012 NASCAR season marked the end of use of the Impala nameplate on stock cars. From 2013 to 2017, Chevrolet drivers began driving the Holden VF Commodore SSV based Chevrolet SS in Sprint Cup until the Chevrolet SS was discontinued after 2017. ^ "History of the Chevrolet Impala 1958–2011". Chevy Impala Forum. Retrieved July 11, 2012. ^ "1994 Impala SS". Motor Trend. June 1994. Retrieved June 26, 2010. ^ a b "Friday the 13th". Pacific/Gulf Coast Productions. December 13, 1996. Archived from the original on March 27, 2016. Retrieved July 17, 2015. ^ Markus, Frank (March 11, 2010). "six-decades-of-best-selling-cars". ^ "THE BLOG; What Car Sold Best? The Impala". Retrieved September 13, 2018. ^ "Best Affordable Large Cars Rankings". U.S. News. ^ "Automobile". Retrieved September 20, 2016. ^ a b c Flory, Jr., J. "Kelly" (2008). American Cars, 1946–1959 Every Model Every Year. McFarland. ISBN 978-0-7864-3229-5. ^ a b "1962 Chevrolet Full Size Brochure". Oldcarbrochures.com. Retrieved July 17, 2015. ^ Gunnell, John (2006). standard catalog of American Muscle Cars 1960–1972. Krause Publications. ISBN 0-89689-433-9. ^ "1964 Chevrolet Impala Sport Coupe 409 V-8 Turbo-Fire 425 HP 4-speed close". automobile-catalog. Retrieved July 1, 2018. ^ "1964 Chevrolet Full Line Brochure". Oldcarbrochures.com. Retrieved July 17, 2015. ^ Flory, J. "Kelly", Jr. American Cars 1960–1972 (Jefferson, NC: McFarland & Coy, 2004), p.412. ^ Gunnell, John, ed. (2002). The Standard Catalog of American Cars 1946–1975. Krause Publications. ISBN 9780873494618. ^ Flory, J. "Kelly", Jr. American Cars 1960–1972 (Jefferson, NC: McFarland & Coy, 2004), p.865. ^ "1980 Chevrolet Impala (VE)". Dkarros.com. Archived from the original on July 10, 2011. Retrieved July 19, 2010. ^ "94-96 Impala SS Production Numbers". www.nookandtranny.com. ^ a b "GM Powertrain Car Engines 2005". Media.gm.com. Archived from the original on March 25, 2008. Retrieved May 11, 2009. ^ "Current-Generation Chevrolet Impala Gets A New Lease On Life". The Truth About Cars. Retrieved March 7, 2013. ^ "Chevy says current Impala to live on through 2014". autoblog.com. Retrieved March 7, 2013. ^ Nishimoto, Alex (October 28, 2013). "Chevrolet Impala Limited Production Extended to 2016 for Fleet Use". Motor Trend. Retrieved March 5, 2014. ^ "Outgoing Chevy Impala lives another year, as fleet-only model". autonews.com. Retrieved March 13, 2013. ^ "Outgoing Impala to Continue as 2014 Chevrolet Impala Limited for Fleets". Motor Trend. Retrieved March 13, 2013. ^ "Fleet Only Chevrolet Impala Extended to 2016". Government Fleet. Retrieved March 5, 2014. ^ Witzenberg, Gary (February 17, 2014). "Interview: Chip Thole, Exterior Design Manager, GM Full-Size SUVs". Truck Trend. Archived from the original on September 25, 2018. Retrieved September 25, 2018. Chip led design of the 2006 Chevrolet Impala, then took on assignments in the U.K.
^ Witzenburg, Gary (December 27, 2005). "2006 Chevrolet Impala: Chevrolet improves its version of the stealth fighter". The Car Connection. DA Acquisitions, Inc. Archived from the original on August 7, 2005. Retrieved November 25, 2018. 'Our goal was to build on the previous car's success and move it upmarket a bit,' said Impala Lead Exterior Designer Louis 'Chip' Thole. ^ "Cleveland Auto Show 2005 Annual Exhibitors Report" (PDF). 10100 Brecksville Road, Brecksville, Ohio: The Greater Cleveland Automobile Dealers' Educational Assistance Foundation Inc. 2005. p. 13. Archived from the original (PDF) on February 12, 2006. Retrieved February 12, 2006. Chip Thole, exterior designer of the 2006 Chevrolet Impala, prepares for an interview with the media. ^ a b "2006 Chevrolet Impala Features & Specs". Edmunds.com. Retrieved July 25, 2012. ^ King Rose Archives (March 28, 2017). "Chevrolet Impala SS Introduced in 2005" – via YouTube. ^ "Chevrolet Impala: 2005 Los Angeles Auto Show". Car and Driver. Hearst Communications, Inc. January 1, 2005. Archived from the original on September 25, 2018. Retrieved September 25, 2018. ^ a b c "2014 Chevrolet Impala". AOL. Archived from the original on May 29, 2013. ^ Nunez, Alex (December 14, 2007). "2008 Chevy Impala 50th Anniversary Edition coming to Detroit". Autoblog.com. Retrieved September 30, 2010. ^ "2009 Chevrolet Impala". Archived from the original on February 21, 2014. Retrieved February 5, 2014. ^ "Model Information – Online Ordering Guide". Eogld.ecomm.gm.com. Archived from the original on May 14, 2009. Retrieved June 20, 2009. ^ "Refreshed 2012 Chevrolet Impala shows its new face". Leftlanenews.com. June 2, 2011. Archived from the original on June 26, 2011. Retrieved June 24, 2011. ^ "GM Confirms Current Generation Chevy Impala Production Through 2014". GM Authority. Retrieved May 13, 2015. ^ "Fear of Night Driving? 2014 Chevrolet Impala Can Help: Study shows high-intensity discharge headlamps can help drivers stop sooner". Chevrolet. Michigan: General Motors Company. October 30, 2013. Archived from the original on December 30, 2014. Retrieved December 30, 2014. Steve McCabe, lead creative designer for Impala. ^ Ewing, Steven J. (May 31, 2011). "2014 Chevrolet Impala to move upmarket, share platform with Cadillac XTS". Autoblog.com. Retrieved June 24, 2011. ^ "Rare praise: Consumer Reports gives Chevy Impala top rating". CNBC. Retrieved May 13, 2015. ^ "GM Invests $68 million for Next-Gen Impala in Oshawa" (Press release). GM Media Online. December 16, 2011. Retrieved December 16, 2011. ^ "2014 Chevrolet Impala Surges Ahead Of Competition After Retail Share, Average Transaction Prices Spike". GM Authority. May 5, 2014. ^ Motors, General (April 4, 2012). "All-New Impala". Media.Chevrolet.com. Retrieved May 13, 2015. ^ Blanco, Sebastian (October 21, 2014). "2015 Green Car Of The Year finalists announced, run alt-fuel gamut". Autoblog Green. Retrieved October 21, 2014. ^ Fleming, Charles (November 20, 2014). "LA Auto Show 2014: BMW's i3 named Green Car of the Year". Los Angeles Times. Retrieved July 16, 2015. ^ "GM grants stay of execution for Cadillac CT6, Chevy Impala until 2020". Roadshow by CNET. February 22, 2019. Retrieved February 24, 2019. ^ "Chevrolet Impala Sales Numbers". GM Authority. Retrieved January 6, 2017. ^ "IIHS-HLDI: Chevrolet Impala". Iihs.org. November 25, 2008. Retrieved May 11, 2009. ^ "Chevrolet Cars, Trucks, SUVs, Crossovers and Vans". www.chevrolet.com. ^ "IIHS-HLDI: Chevrolet Impala". Iihs.org. September 1, 2010. Retrieved September 30, 2010. ^ "GM says bankruptcy excuses it from Impala repairs". Reuters. August 19, 2011. ^ Timmins, Be (August 19, 2011). "New GM: 2007-2008 Impala Suspension Problems Were Old GM's Problems, Not Ours". Automobile Magazine. Retrieved February 7, 2018. ^ Ewing, Steven J. (April 22, 2014). "2014 Chevy Impala being investigated over braking issue". Autoblog. Retrieved February 7, 2018. ^ "Automobile.com Fleet Segment Awards". Archived from the original on June 27, 2006. ^ "Chevrolet Sweeps 2008 Fleet Car & Truck of the Year". Wikimedia Commons has media related to Chevrolet Impala.